"Give Me Your Big, Your Long, Your Heavy Masses, Yearning to Breathe Free". Like the Statue of Liberty, our arms are open to welcome and save big, heavy and long logs. How often have you seen that giant tree trunk cut into firewood lengths no one wants? Old trees deserve to be remembered. 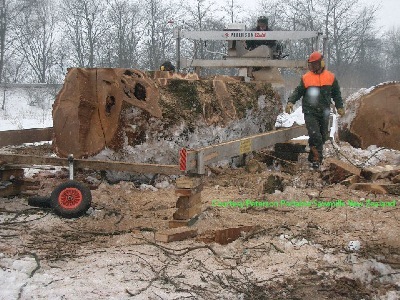 Call us about milling your BIG LOGS! 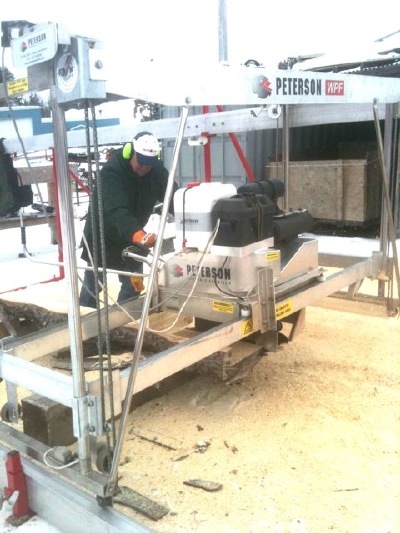 I use the Peterson WPF circular swing mill for sawing boards and beams from larger logs. 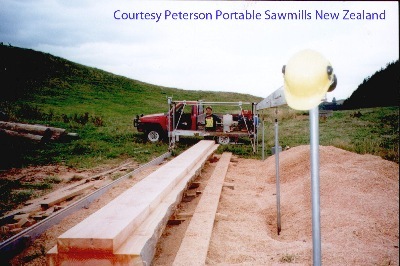 This mill has a 26" diameter circular blade that swings between horizontal and vertical to make up to 10" deep cuts, in logs up to 5 feet diameter and 33 feet long. 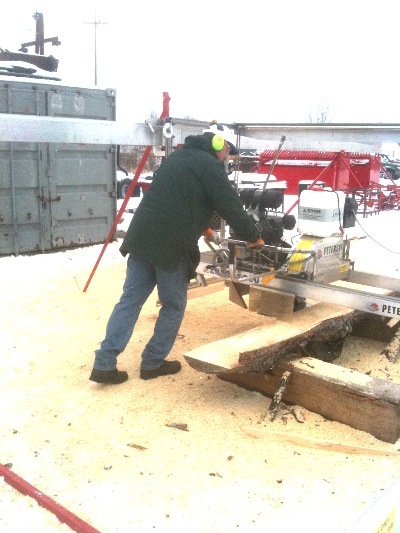 The log is typically not turned or moved with this sawmill except to adjust it at the beginning for optimum results. Boards up to 20" wide can be sawn out of logs, in the horizontal dimension. 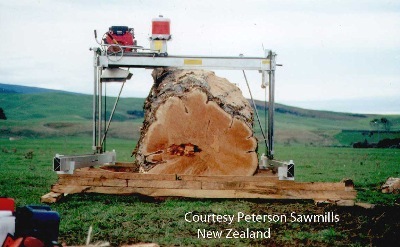 One of our mills is a Peterson sawmill from the Peterson Sawmill Company in New Zealand. This is a different type of mill called a Circular Swing Mill. More specifically it is a Peterson 10" Winch Production Frame Swing Mill. 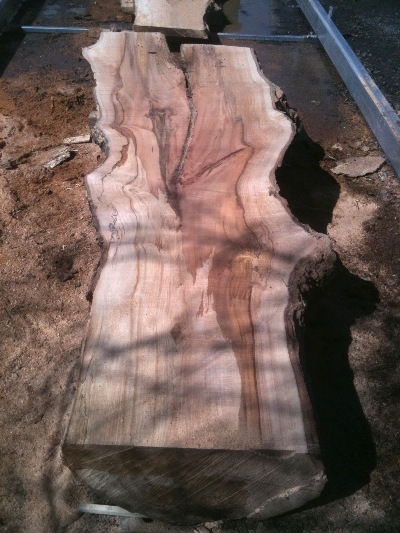 WIDE SLABS - slabbing unit can produce boards to 5 feet wide if desired. 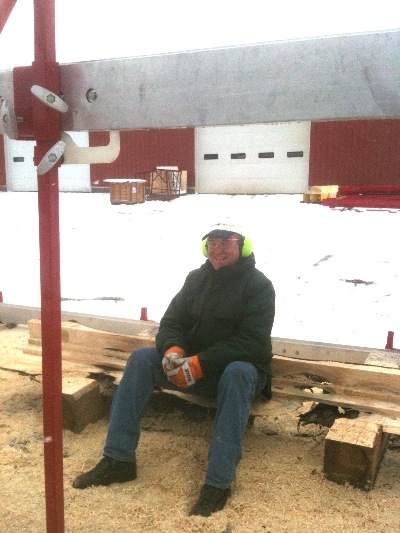 Dennis training on Peterson Mill at Hud-Son Co., Barneveld, NY. Hud-Son is the U.S. distributor for Peterson. Slabbing a hard maple log in the chain slabber mode. 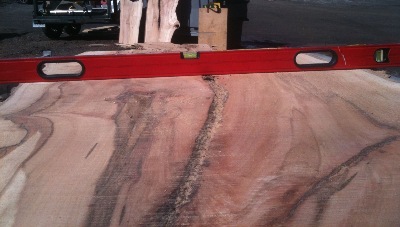 The slabber performs very well, there was about 1/16" variation from flat across over 36" width of this maple crotch. End to end there was about 1/8" or less variation in the slab, and it was within 1/8" of the target thickness all around. The slabber cuts down to below the rails, finishing this maple log without needing to raise it for the final cuts. 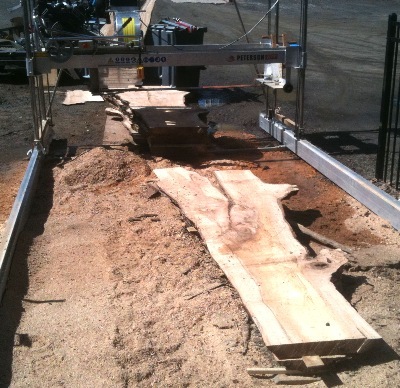 There are 6 other slabs in front of the saw. We rolled them off of the work slab one by one with PVC pipe rollers.